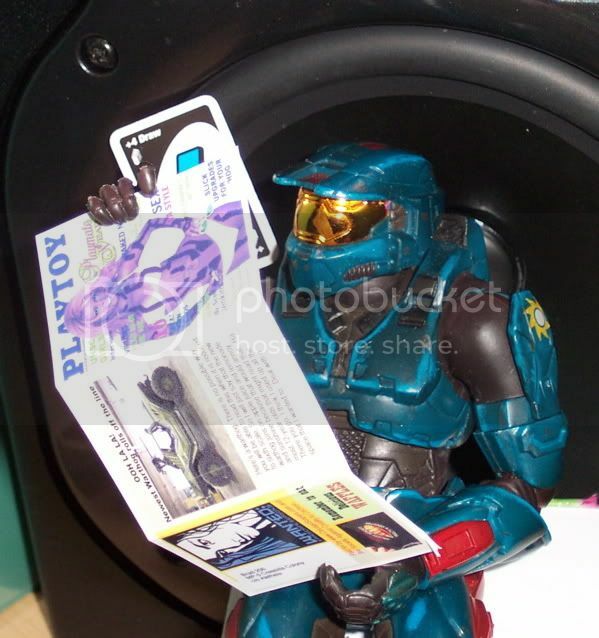 2008 Disclaimer: Halo Action Figure Theater is a work of fiction. Any resemblance between the characters herein and real persons living, or otherwise, is purely coincidental. Oh, except for that “Lauren” character. That one is EXACTLY like OboeCrazy. Sure. I had a choice of many different things Brad could be doing while he was bored doing surveillance on the MIB flotilla. 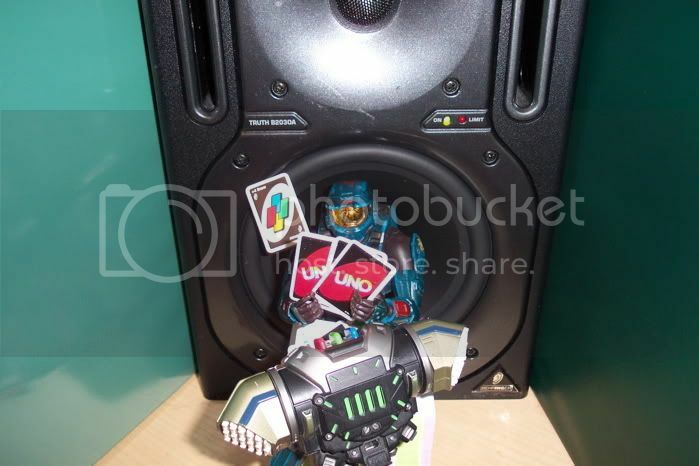 He could be playing UNO. He could look at naughty magazines. He could dance a cotillion. He could be sanding the lighting bolt. (No picture available.) Many options. Ultimately, I had a pretty dress for B. that I hadn’t used, so I ended up doing another “MiB vs. Barbie” shot. Why? Because it’s fun. And Pixilz commented that my comic needed more passion. So… there ya go. Next up, Steve and Lois, giving new meaning to the phrase: “Conjuring the Banjo”. 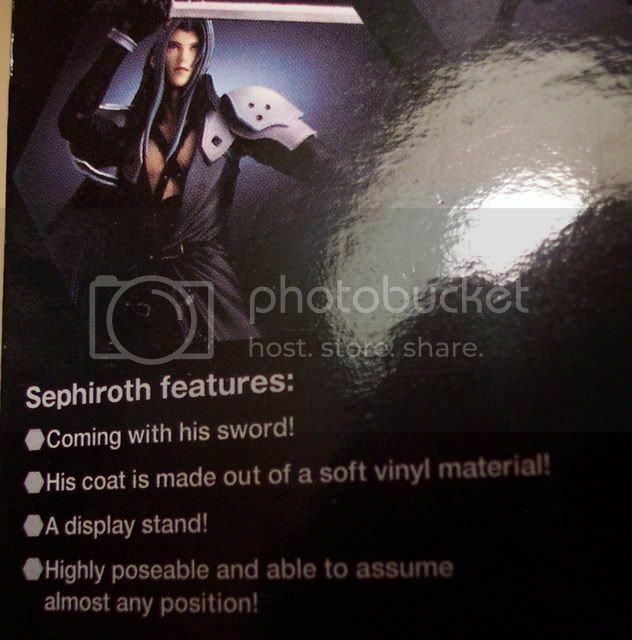 Yeah, I realize my French is probably about as good as Sephiroth’s English, but “A display stand!” might be my new battle cry. So, anyway, I have to ask your opinion. For the summit, I have to pick what Chuck is going to wear. I have three options. He can wear his regular GI Joe green outfit he always wears. He can wear some formal clothes I got from Dragon or BBI, I can’t remember, or he can wear dress whites, which I would have to modify a bit to bring them up to admiral rank. I am leaning toward the Admiral thing, but since he is Chuck Norris, I’m not sure he necessarily has to wear military clothes. Which to choose?! This entry was posted on Tuesday, January 1st, 2008 at 2:55 am and is filed under Comics. You can follow any responses to this entry through the RSS 2.0 feed. You can leave a response, or trackback from your own site. i say make ”a display stand!!! !11” your battle cry. it will be cool.